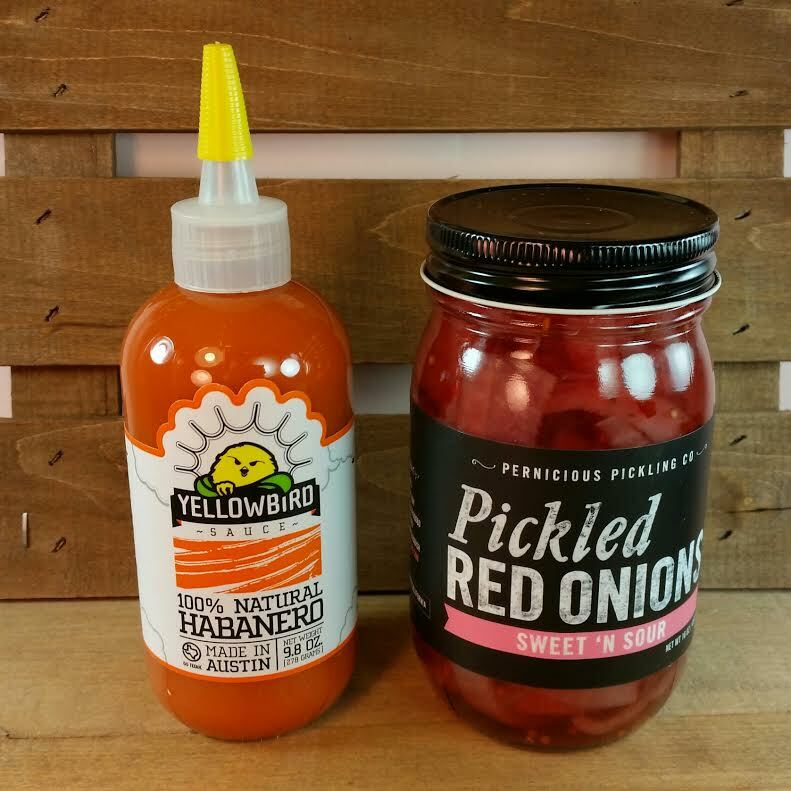 Yellowbird Sauce 100% Natural Habanero-A deliciously spicy blend of carrots, habanero peppers, onions, garlic, tangerine juice, and lime juice. This is super spicy and delicious according to my husband. He then demanded that I make tacos so that he could eat it instead of drinking it. Don't ask me why he was drinking it because I don't know. Pernicious Pickling Co Pickled Red Onions Sweet and Sour- This box was basically made for my husband. He loves red onion. And he loves pretty much pickled anything. I'm guessing he ends up eating most of these plain. I did sort of gross out when I read that these could be tossed with grilled octopus and smoked potatoes. Mainly because when we were in Croatia we had a special octopus dinner. We had to make reservations so they could go out and catch the octopus in the morning, then cook it allllll day under a bell in ashes (with potatoes) in a brick oven the size of a room. The first couple bites were really quite good. But as it good cool... Not so much. And then I couldn't get over the tentacle-ness of it. The charred "suckers" were pretty good. But with too much medicinal grappa sloshing in my stomach, I just couldn't continue to eat anymore octopus. Urgh. Ah, well. A once in a lifetime opportunity like that shouldn't be passed up. Instead, we'll just eat pickled red onions. Hernan Mole Poblano- Hernan's Mole Poblano is a blend of 28 chilies and spices balanced by nuts, chocolate, raisins, piloncillo (Mexican unrefined cane sugar), and other natural ingredients. Crafted in Mexico from 100% natural ingredients, Hernan’s product is made using traditional roasting and grounding methods that result in a thick spicy mole paste. I don't like mole but this isn't for me. This is for DH and he does. So now I'll have to concoct a dish for this. 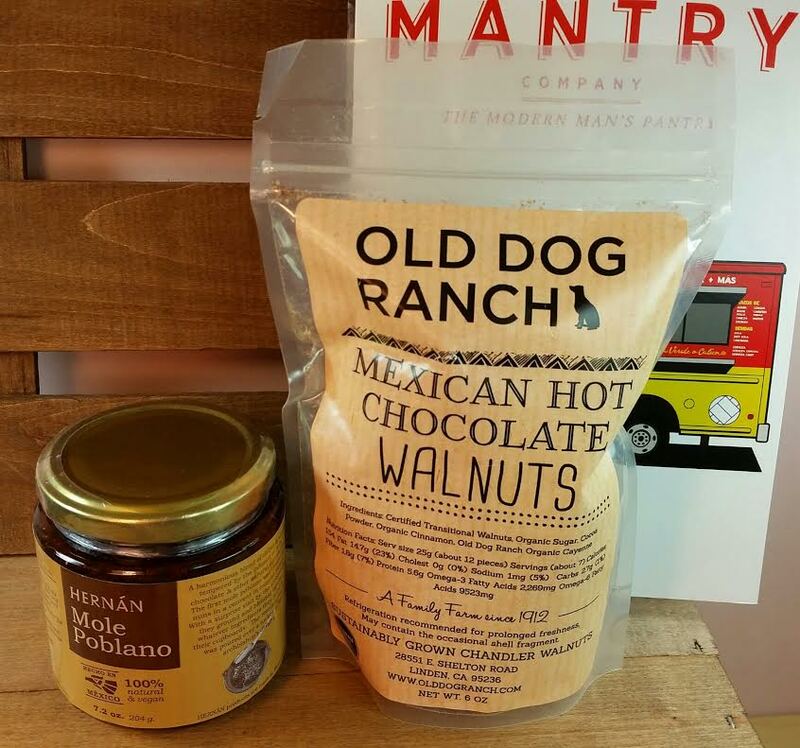 Old Dog Ranch Mexican Hot Chocolate Walnuts- These are roasted with extra rich cocoa, organic cinnamon, organic sugar and organic cayenne. Mostly sweet, with a touch of spice. These have mysteriously disappeared so I haven't been able to try them but they sure sound good! Deano's Jalapenos with Sea Salt- Crispy jalepenos sprinkled with salt. Probably good on a salad for some crunch or eaten plain like Walker is doing. 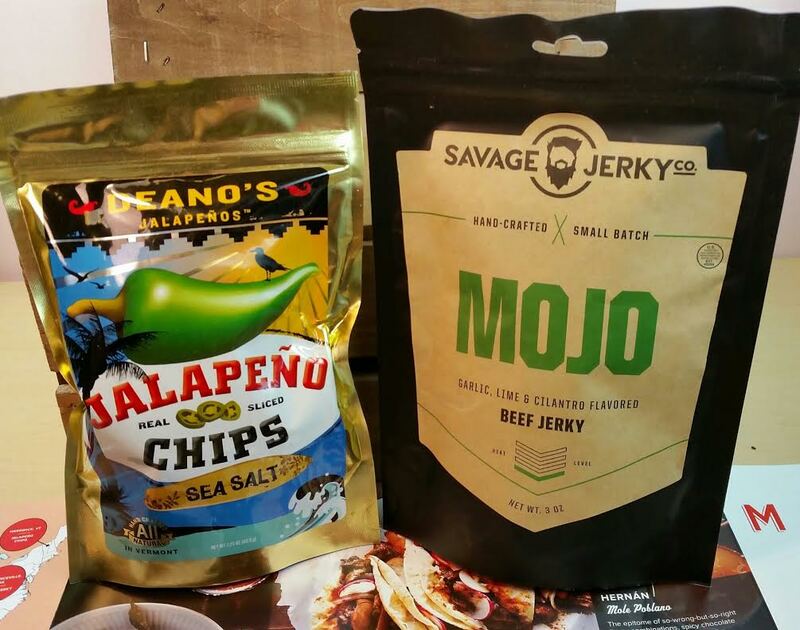 Savage Jerky Mojo Beef Jerky- The traditional Mojo offers hints of lime, cilantro, garlic and cumin while bringing out the great beef flavor of handmade jerky. A perfect snack for the member of the family that might not like it on the spicy side. That would be me but this was not what I was expecting. I thought it would be beef soaked/marinated in those things but it's actually coated in it. Which makes licking your fingers fun but this isn't my favorite. VERDICT: The biggest drawback to Mantry is their lack of value. You're paying a whopping $75 for food items that usually run about $50. That's... not good. I'm just going to say it's terrible. Sure, you get it in a super awesome crate but I expect a food box to break even or at least come really close. This rarely happens with Mantry. The foods are unique and interesting. Things you won't necessarily find anywhere else. We usually only get Mantry when they are on "sale." They tend to pop up on Gilt City and/or Rue La La somewhat regularly so we have gotten several boxes. I have no problem paying $37 or so for these but $75 is a no-go. And considering this box was worth $45, even $37 is pushing it. 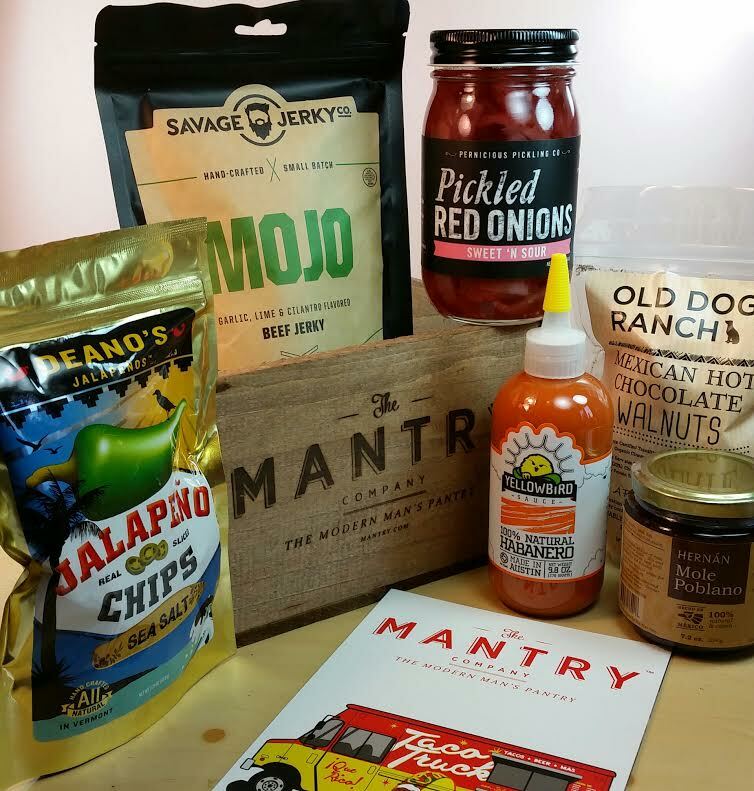 If you are intrigued and don't want to wait for a sale, you can sign up here at Mantry.com. It's really easy to subscribe and cancel. Customer service is quick and excellent. Mmm that habanero sauce does sound really delicious. I would probably try to drink it too!